Earlier this month, Sir Terry Pratchett, the English fantasy novelist best known for his many-volume Discworld series, published an article in the Daily Mail in which he advocates for death with dignity and the right to choose such (and get help if needed) for people who face lingering, terrible ends. 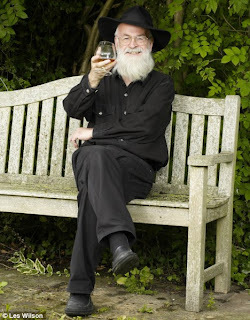 A couple of years ago, Pratchett was diagnosed with Alzheimer's. Fortunately, his cognitive function remains quite high and he is still able to be an advocate for the position he expresses in his article. Please go over to The Region Between, where I have reprinted Pratchett's piece in full, preceded by a short intro from me.